We are exploring the Gold Plan (for FREE) of Magzter (online shop for Books / Magazines and other interesting media). Read complete details for the same here. It was 1st May 2015 and we were eager to see how timely the May issues of our favorite magazines make their appearance here. We are glad to see Safari Magazine’s May 2016 issue appeared quite timely here, even before Reader’s Digest (India)’s May issue. And we have complete reading the same on our iPhone4 using Magzter app. It was an amazing experience though we need to Zoom in-out content while changing pages and reading the content. The cover page is made up using cheery colours. 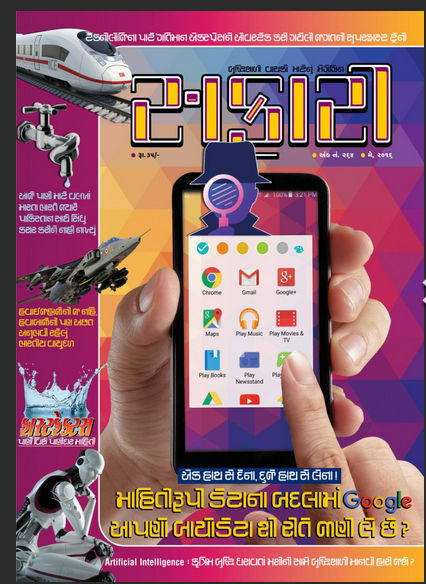 A mobile phone image covers almost half of the cover page, showing the weightage of the themed article of the issue. And almost every other article make an appearance as a thumbnail here. So we can sum it up as, an informative and attractive cover page. An article about Harshal Pushkarna about Google (FaceBook, Twitter and many other websites fall in the same arena) and your personal data is something you shouldn’t avoid reading. While Google as a search engine provides you the best results for whatever you are searching for; it gets some personal information about you to give you results which you find interesting. Google tracks your search history to know more about you and your interests to provide you even more concentrated advertisements. Running such a big search engine and other companies under the same hood is very expensive task and Google gets most of it’s revenue from Advertisements. We know that when you want to make the most of any advertisement it should be appealing, look effective, targeted to the right audience and look more personal (so can touch the emotional aspect of a human being). And to deliver you the advertise which you will follow (and make a purchase, to be precise), knowing more about you is the best way. Google knows it and it follows the basic rules, collect data, analyse it, get targeted advertisements which you like to follow, and,… they are done. In this article, the author explore many of these things in detail. The imaginative example at the beginning of the article is interesting, and it gives right kick off to the article. (However it is an imaginative example for fun, if we rely heavily only on technology, it may be reality in future). As these days we are using Internet (which includes Search Engines, E-Commerce websites, Online banking, Social networks and much more) we have to understand the basics very clearly. This article will help you doing that. I, on the personal ed, want to add one more thing here. We love watching movies and TV Shows and we know how smart the thieves are right? Of course they have to be smarter than the security personals to beat them. So don’t you think the criminals are also making technological advancements, and using these media in better ways than most of us. When you post on a social network that you are our for some days for enjoying a vacation; or even you are watching a late night movie show with your friends; Or taking a dinner somewhere with someone; aren’t you spreading the fact that your home/office is out of your reach; probably no one is there. Don’t you think you are inviting shady characters to come and get the benefit of your absence? Well, there should be self-controlled limit on what you should post on social media. Also, don’t rely on a single password across multiple websites. And don’t use the same company’s hosted email as primary login for all your bank accounts. Remember, there is no Free Lunch. So if a company is providing you something for free, they are definitely taking something from you, with or without you knowing. When there are talks of Indian Railways introducing even faster trains, an article about super fast trains around the world; is quite on time. Author B. M. Purohit did his research and wrote the summarized details in interesting manner. There are 10 points he covered in the article which brings a lot of facts. This 13 page long article about Sindhu Water Treaty between India and Pakistan is full of facts and clearly shows how biased it is, and how it costs to the public of India. In this article author Nagendra Vijay have wrote a very long disclaimer also, or rather put his point in a valid way. When he raise questions about some of the wrong decisions taken by first prime minister of India and some of his successors, in past, he got comments from some of the readers that he is quite biased and writing against some prominent figures. He clarifies here that every coin has two side, and every person has strong and weak side. While he admire the qualities or strengths of a person, he reserves the right to talk about weak sides also. It is not about loving or hating a person, but just his right and wrong decisions. This article is also tend to get some controversial response from a group of readers. But if you read it with an open mind, and just focus on the facts, you will find it neutrally talking about the wrong is done with the common-men of India. It heavily affected Indian economy also. We suggest you to read the following Wikipedia article before reading it. Unless you are strong enough, everyone will come to beat you. While Indian Air Force is best in many categories, it needs some inforcements. The current government is doing some nice works to modernise it, but there is still long way to go. While some facts are not released due to security reasons, it is evident that the Air Force is in need of more AirCrafts, Air Careers and other supportive vehicles and machinery. Even more important is the need of pilots. Despite of having man-less air careers and drones, there are majority of stuffs which are or can be done (at least at this stage) by pilots only. A detailed article aobut it is a must read for every Indian, specifically. This segment brings answer for the following questions. The answers are detailed and logically explained. It is worth reading and is going to improve your knowledge. How Adansonia Digitata (and other trees of it’s family) trees are capable of storing so much water in its trunk? How Burma was separated from India in 1937? We are writing oC and oF, but why it is wrong to use o when referring temperature in K (Kelvin)? How many species of Whales exists? Which is the rarest of rare among them? One Indian company is trying to bring the foreign technology of transportable Kinetic Energy Pwerhouses to India, why it is so important? Is there any bird which uses clay and dust particles to create its nest? How the blade-less table fans work? Which models of Aircrafts and Helicopters stationed at Jamanagar air base? The Super Quiz section this time explores a wide range of topics and it is really interesting read. There was a man v/s machine competition for the game Go arranged during Mar 9-15, 2016 in Korea. During this competition Google’s AlphaGo computer beat the Lee Sedol, the champion of the game! Many of his supporters literally cried on this occasion. This game once again make people talk about the dangers of AI (Artificial Intelligence). There are many who consider man v/s machine battle seen in Sci-Fi movies as a reality of future! A few curious readers asked a question about the incident and its after effects. And there is a very detailed answer of the question printed in the magazine. If it is the only article in the magazine, then also it was worth its price for sure. So just go for it. By the way, if you want to know about AlphaGo v/s Lee Sedol; here are some public vides available on Youtube for your reference. Do let us know your views about this article via comments below, we like to read you. And yes, do not forget to share this article with your friends who you think are interested in quality reading. Previous: How To Recover Deleted Files Using MiniTool Power Recovery 7.0 Freeware?